A look ahead to the 2017 hurricane season shows that a near normal year in terms of total activity and U.S. landfall risk is the most likely outcome. Uncertainty remains elevated at this lead time. This forecast is for less activity than our December first look due to both cooling of Atlantic sea surface temperature anomalies and an increase in the chances of El Niño this summer, which is unfavorable for Atlantic tropical cyclone development. However, our modeling indicates that many ENSO forecasts are biased toward a stronger fall El Niño than justified by current trends. 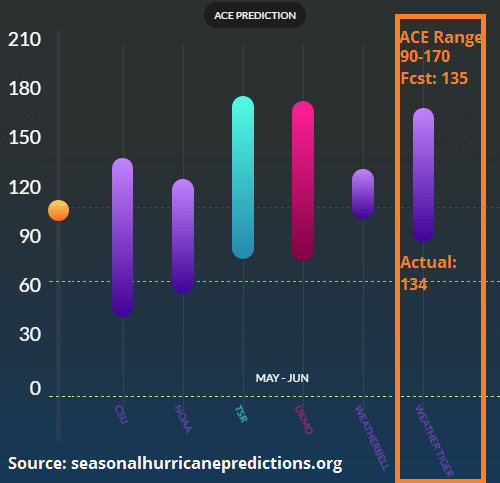 We believe spring conditions are not indicative of well below average activity in the upcoming hurricane season, though forecast confidence is somewhat lower than usual this year. As noted previously in December’s first look at the 2017 hurricane season, the forecast for the upcoming year remains a riddle, possibly wrapped in an enigma. The December forecast put down an early marker of 40-45% chances of above normal, 20-25% chances of near normal, and 35% chances of below normal Atlantic tropical cyclone activity in 2017, with this bimodal distribution in probability due to greater-than-usual uncertainty regarding ENSO evolution. Four months later, the crucial questions remain whether El Niño will develop at all, and how strong it will be. This question is so critical because positive ENSO state is the most assured way to wreck a hurricane season. Above, we’ve binned overall Atlantic hurricane season activity in terms of Accumulated Cyclone Energy (ACE) by the oceanic and atmospheric ENSO conditions during the heart of the season in August and September, from strong La Niña to strong El Niño. While La Niña years in aggregate differ little from seasons in which there is no discernible ENSO influence, any El Niño event usually results in less Atlantic tropical cyclone activity as well as less U.S. landfall activity, with strong El Niños averaging only 40% of typical activity and U.S. landfall energy. The physical pathway by which El Niño reduces TC activity is by inducing wind shear (which is basically to tropical cyclones what United security is to passengers) over the Caribbean, Gulf of Mexico, and western Atlantic. With that in mind, what has changed regarding ENSO since the winter? There are several key developments. First, this winter’s weak La Niña event dissipated a bit earlier than anticipated, with the central equatorial Pacific returning to near-normal sea surface temperature (SST) anomalies in January and remaining there since. Additionally, a powerful warming trend along the coast of South America has sent SSTs above average in the east Pacific, as shown above. Many dynamical models through the spring have extrapolated these trends to suggest a moderate or strong +ENSO is in the cards for the summer and fall of 2017, while statistical models have been generally more reserved in their judgement. This is discussed in more depth in WeatherTiger’s April ENSO forecast product. are somewhat skeptical of this for a few reasons. First, while most El Niños are preceded by warmer than normal water at depth in the Pacific, observations show a trend towards a central Pacific cold pool over the past month, with aggregate upper-ocean heat anomalies very slightly below normal. Second, despite SST warming, the atmospheric pattern remains more suggestiveof a lingering weak La Niña influence than a developing ENSO. Finally, the bullish dynamical models, including the European model used directly as a predictor by other seasonal hurricane forecasts, have been much too warm in their ENSO forecasts over the past nine months. WeatherTiger’s own ENSO forecast model, shown here, predicts a slow drift towards minimal weak El Niño conditions through the summer, followed by perhaps slight cooling into the fall. This trajectory skirts the threshold at which ENSO becomes truly detrimental to Atlantic TC activity and is warmer than our December assumptions, but cooler than the ENSO input to other hurricane forecasts. 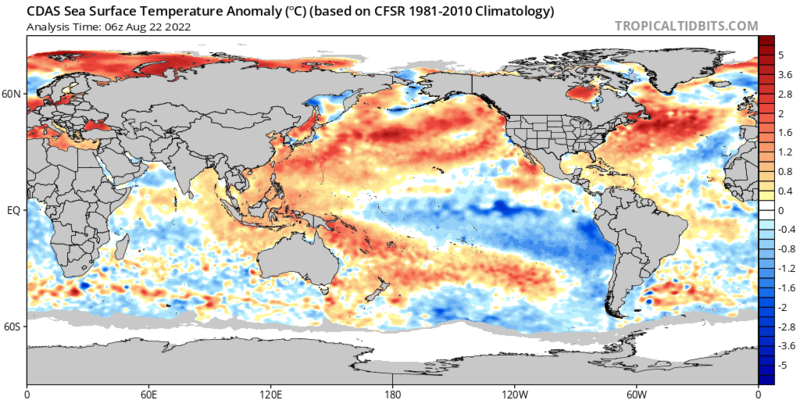 It also should be noted that the atmospheric signature of ENSO can sometimes lag or be muted relative to the ocean conditions, and that the atmosphere currently is quite removed from resembling an El Niño state. 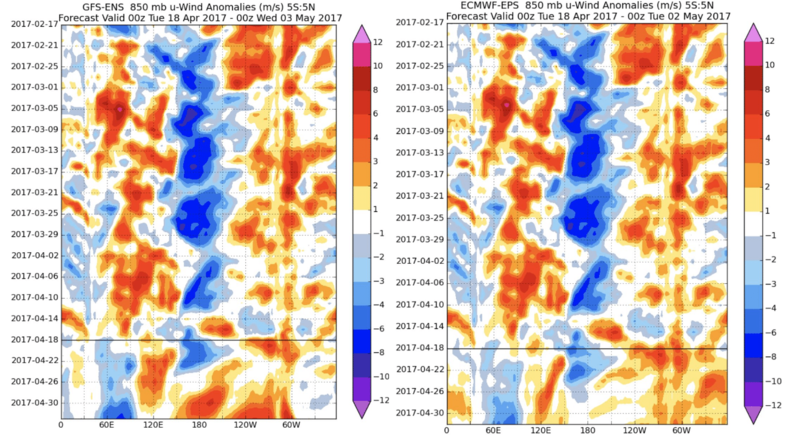 The next six weeks will determine a great deal, as long-range El Niño forecasts are most difficult between March and May and models are split on the extent to which trade winds will drive the Pacific toward a more El Niño-like state in the next several weeks. The other notable change is that the tropical Atlantic is a little cooler relative to average currently than in December. At that point, the Atlantic Multidecadal Oscillation (AMO) was about +0.4C above normal; in March, AMO dropped to +0.18C, which is a zone in which the effects of the warmer than average Atlantic SSTs are more marginal. However, SSTs remain above average in several key regions indicative of the potential for an AMO rebound over the next few months, and the general pattern over the next month is likely to also be conducive to Atlantic warming. Long-range climate models are hinting at a favorable AMO state for the core of the hurricane season, but these models have little skill at this range so take that with a grain of salt. Another leading indicator of Atlantic TC activity is sea-level pressure (SLP) in the eastern subtropical Atlantic, with lower spring values linked to more favorable trade wind conditions later in the year. This spring, SLP has been consistently below average in this area, as shown at left, persisting into April. In short, two important spring predictors based on current conditions are modestly supportive of near normal to somewhat above average activity; the threat of El Niño developing lends the downside risks to the 2017 forecast. Reports of El Niño’s arrival may be greatly exaggerated, but a broad range of outcomes remain within the realm of the possible for 2017 Atlantic TC activity. If a moderate or strong El Niño develops, there is the potential for the bottom to fall out, particularly as Atlantic SSTs are not especially warm this spring. However, the odds of this are lower than a few months ago, and we believe they are below the estimates of dynamical models. 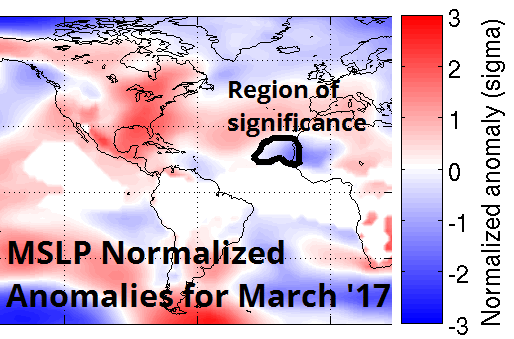 Otherwise, spring SST/SLP conditions are generally supportive of normal or above normal Atlantic TC and U.S. landfall activity in 2017. Synthesizing these strands, WeatherTiger’s TigerTracks model is projecting updated odds of a 25-30% chance of a below average, 40% chance of near normal, and 30-35% chance of an above average 2017 hurricane season (less than 70, 70-125, and 125 or higher ACE, respectively). The single most likely outcome is ACE of 110, with 14 tropical storms, 7 hurricanes, and 2-3 major hurricanes expected (including today’s newly formed Subtropical Depression 1, should it become Arlene). These objective forecasts are less active than the December first look, reflecting increased chances for detrimental summer ENSO conditions, as well as modest Atlantic SST cooling. WeatherTiger will release a detailed forecast of Atlantic activity and U.S. landfall risks in early June, when some of the uncertainty surrounding the potential El Niño will hopefully have cleared. 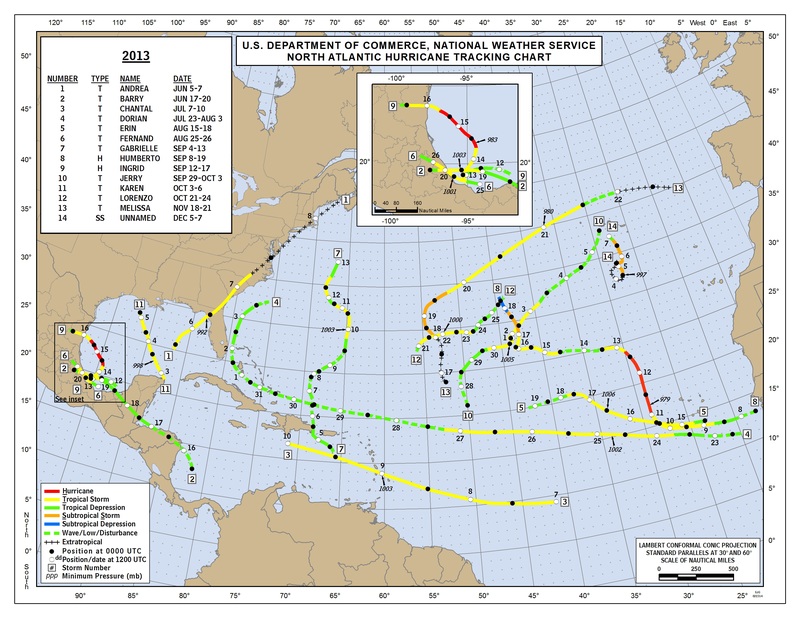 The 2016 hurricane season was the first above average year in the Atlantic basin since 2012, and produced four tropical storm and two hurricane landfalls in the continental United States. These outcomes were in-line with WeatherTiger’s pre-season forecasts, which called for an active year. A first look ahead to the 2017 hurricane season shows that early odds again favor a more active than normal Atlantic next year. Factors influencing this forecast include warm ocean temperatures in the Atlantic and the expectation of neutral El Niño/Southern Oscillation conditions in the summer and fall of 2017. 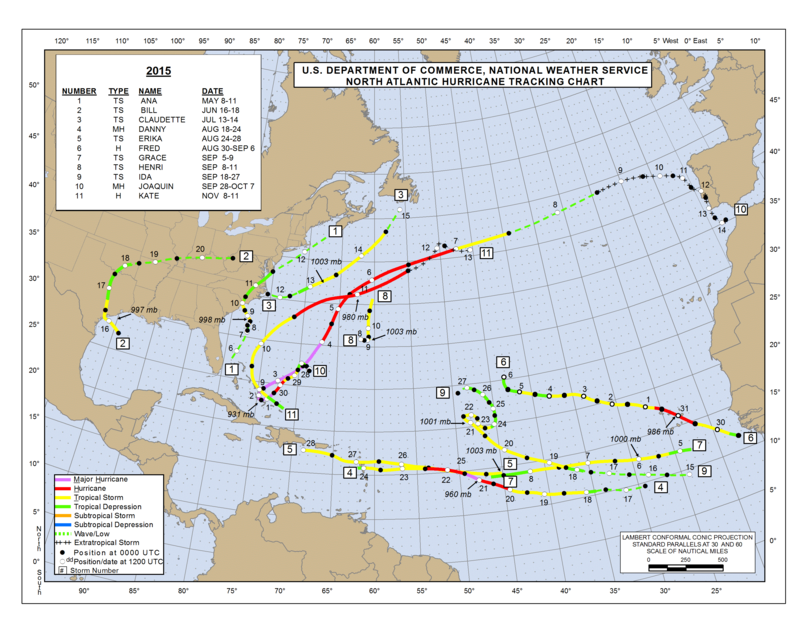 Hurricane Hermine’s landfall on September 1st ended Florida’s hurricane landfall drought, which stretched back to Wilma in 2005. Hurricane Matthew was the first category 5 hurricane since 2007, and had one of the most rapid intensifications ever in the Atlantic. Matthew also very nearly ended the 11-year drought in major hurricane landfalls in the U.S., passing about 30 miles east of Cape Canaveral as a category 3 hurricane. Despite remaining offshore the Florida coast, Matthew still caused over $10 billion in damage and tentatively ranks as the 10th most expensive Atlantic hurricane. Hurricane Otto, which impacted Central America on Thanksgiving Day, is the latest Atlantic hurricane landfall and came within 5mph of being the latest Atlantic category 3 hurricane on record. Overall, 2016 was a busy year in the Atlantic, with the most significant tropical impacts on Florida and the Southeast coast in over a decade. However, despite all the unusual events in the Tropics in 2016, we here at WeatherTiger won’t need to eat any bugs as penance for our seasonal forecasts this year. Our pre-season outlook, issued on 1 June, pegged a most likely outcome of 135 Accumulated Cyclone Energy (ACE) units, 14 tropical storms, 9 hurricanes, and 3 major hurricanes, which was very close to the final tallies of 134/15/7/3 (subject to post-season revision by the NHC). This put our June ACE number closest of the research groups tracked by a re-insurer forecast clearinghouse, as shown at left (paging DJ Khaled). The Independence Day sequel may have been a disappointment, but the 2016 hurricane season was, as advertised, a resurgence. On a scale of 0-5 spicy chili peppers, 2016 earned a solid  1/2. It was no 2005 (), but certainly no 2013 (1/2) either. More importantly, our most likely U.S. landfall numbers from our proprietary TigerTracks model of 4 tropical storm (or above), 2 hurricane, and 0 major hurricane landfalls, verified exactly right, give or take those 30 miles from Cape Canaveral. The eastern Gulf Coast (TS Colin, Hurr. Hermine) and Southeast U.S. (TS Julia, Hurr. Matthew) were also highlighted as being at the highest landfall risks relative to climatology, which worked out nicely. Our August update backed off on the overall expected activity due to a revision of La Niña expectations towards neutral conditions, but still highlighted the Gulf and Florida coastlines as remaining at elevated landfall risk. Overall, our experimental forecasts did well this year, and we have a lot of improvements rolling out next spring to build on this momentum. More on that below. Coming as it did on the heels of three consecutive well below to below average hurricane seasons, the above average activity in 2016 raises the question of if the Atlantic will return to the historically elevated activity noted on average between 1995 and 2012. These years correspond to the favorable positive phase of the Atlantic Multidecadal Oscillation (AMO), a 50-60 year cycle of warmer and colder sea surface temperatures. Average activity over 1995-2012 was roughly 140 ACE units, 15 tropical storms, 8 hurricanes, and 4 major hurricanes, which is significantly higher than the long-term mean since the beginning of the satellite era in 1966 (98ACE/12TS/6H/2MH). 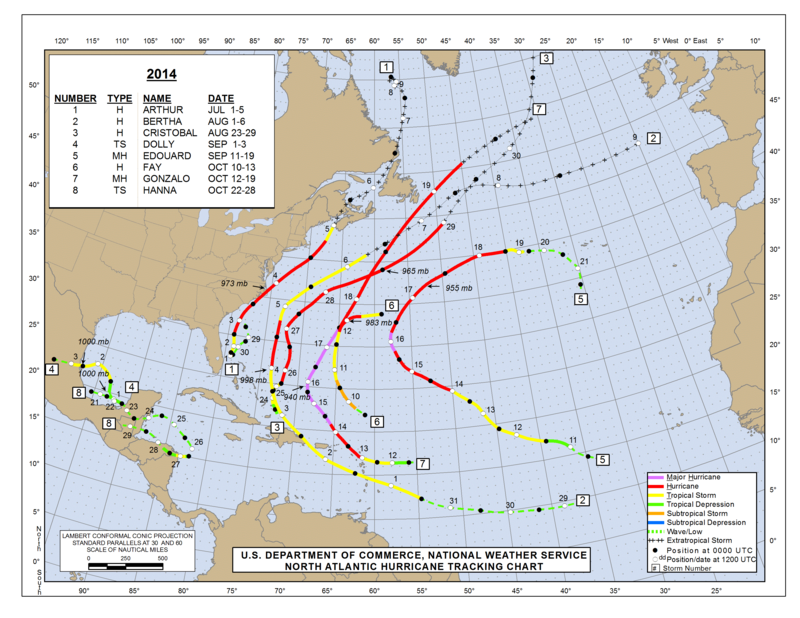 As 1995-2012 also corresponded to a period of severe landfall impacts in the U.S., this would be a cause for concern. At this range, forecast skill in predicting the next hurricane season is limited, but the early indications are that 2017 might follow 2016’s lead. There are two key predictors worth examining after the end of the previous season. The first is the strength of the positive AMO signal, which basically is whether the Atlantic remains warmer than average in the places that have an impact on expected tropical cyclone activity. As these warm anomalies tend to persist into the next season, the November AMO value has some predictive power, explaining a little less than 30% of the next season’s variability, as shown at right. This year, the November value of the AMO is actually the highest it has been since 1948, indicating that key parts of the Atlantic are about half a degree warmer than normal. All else equal, this favors above average activity in the Atlantic in 2017. 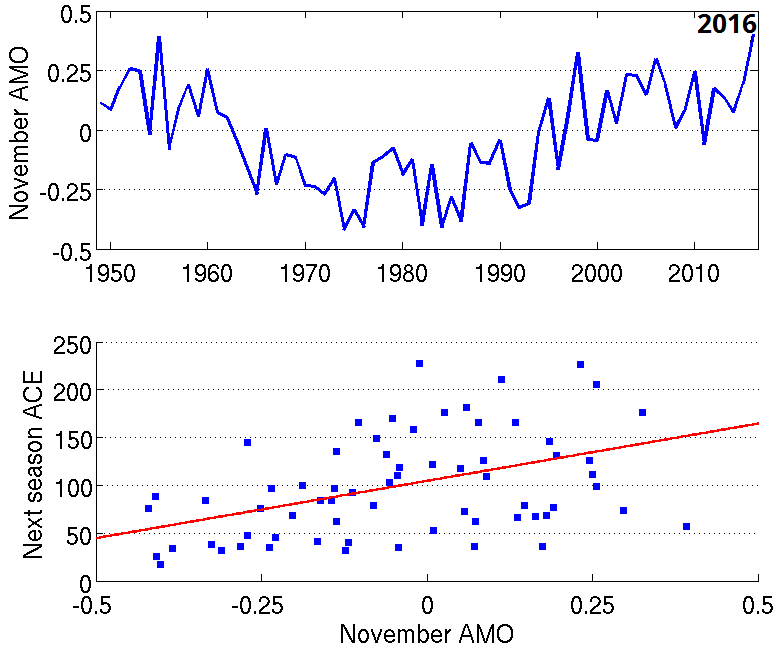 However, as seen on the graph, while a November AMO below -0.15 is almost always associated with a below average or average next season, positive values have been followed by a broad range of seasonal outcomes. This points to the numerous other seasonal and sub-seasonal influences on the annual Atlantic tropical activity, including many we cannot hope to quantify nine months ahead of the core of the 2017 season. One influence that we can at least semi-productively speculate on now is the state of the El Niño-Southern Oscillation (ENSO) next summer and fall. Currently, the eastern Pacific is in a borderline neutral-negative/weak La Niña state, which likely aided late-season activity in 2016. La Niña is struggling to hang on and unlikely to persist into the summer and fall of 2017. 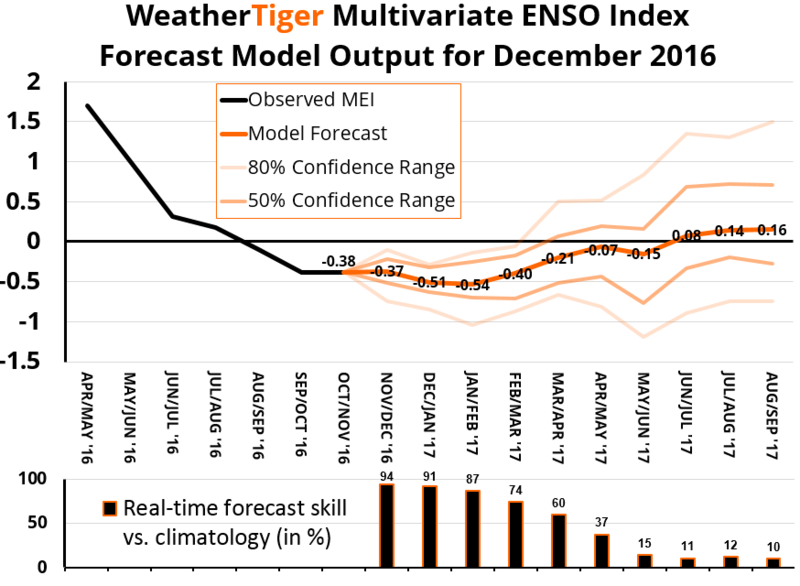 According to WeatherTiger’s exclusive “ENSO Whisperer” model, look for two-to-four additional months of “Niña-like” conditions before a trend towards moderation over the spring. Currently, the ENSO Whisperer is forecasting neutral ENSO conditions for the summer and fall of 2017, though forecast skill after the spring is low. These expectations are consistent with other dynamical and statistical models of ENSO, although perhaps favoring a bit slower of a transition to neutral conditions. 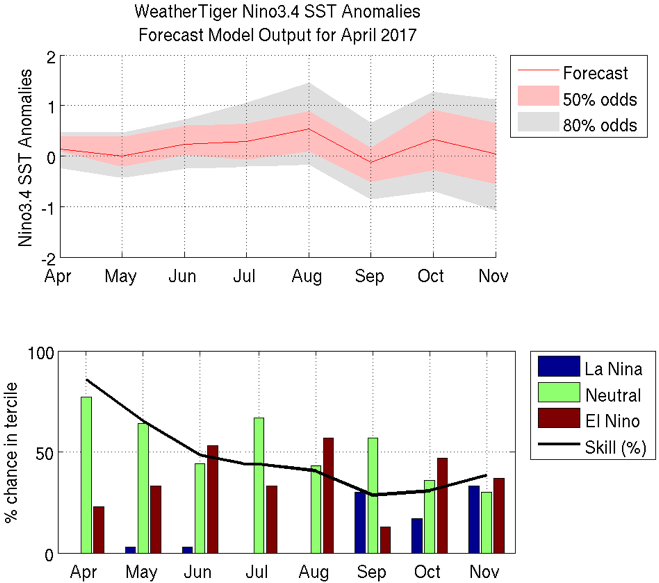 This model output indicates that it is far too early to rule out an El Niño for the 2017 hurricane season, particularly a weak or moderate event. 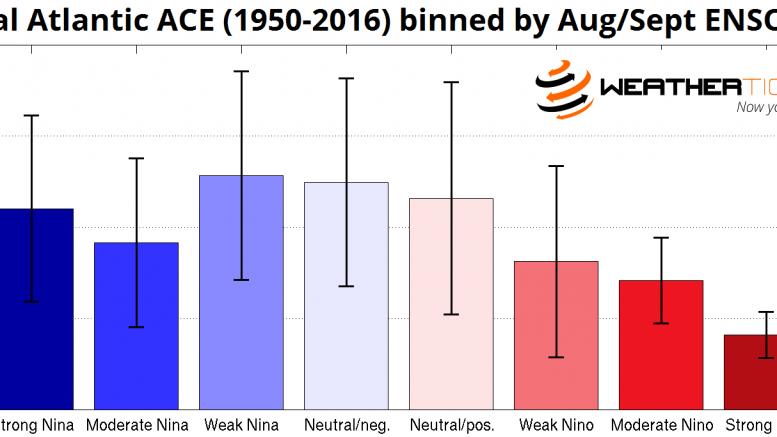 El Niño (generally defined as index values greater than +0.5) tends to result in less active Atlantic hurricane seasons by increasing the vertical wind shear over the Atlantic Basin during August through October. Calibrating the model run with its historical real-time errors, ENSO Whisperer is telling us that probabilistically, there is about a 15% chance of La Niña, 50% chance of neutral, and 35% chance of El Niño conditions in August and September of 2017. While stronger El Niño events have resulted in some of the quietest hurricane seasons on record, even relatively weak El Niños can have a significant negative impact on overall Atlantic TC activity. The evolution of ENSO expectations should be watched closely over the next six months. Still, there remains a better-than-even chance of generally favorable SST patterns in 2017, which means the odds of an active hurricane season are higher than normal. Integrating the supportive AMO and ENSO expectations into our models, WeatherTiger’s early guess for overall activity in 2017 is about 130 ACE units, 15 tropical storms, 8 hurricanes, and 3 major hurricanes, which is close to both the 1995-2012 average and 2016 observed activity. In probabilistic terms, there is about a 40-45% chance of above normal, 20-25% of near normal, and 35% chance of below normal activity in the Atlantic in 2017, where these categories correspond to 125 or more, 70-125, and fewer than 70 total ACE units. This distribution of outcomes is somewhat bimodal, reflecting the possibility that the eastern Pacific tips back into El Niño over the late spring or summer. In terms of the landfall risks, WeatherTiger’s peer-reviewed research documented this year in Geophysical Research Letters how tenuous the relationship between overall activity and U.S. tropical cyclone landfalls can often be. At present, the lead time to the peak season is too long for the current version of our signature TigerTracks model of U.S. hurricane landfall risks to have significant forecast skill. At WeatherTiger, we will never sell you model output that doesn’t have validated skill in replicated, real-time forecasting, so expect our first read on U.S. landfall risks with the April forecast update. In short, there are some early indications that next hurricane season may be once again an above average year in the Tropics– let’s call it another  1/2 year, provisionally. WeatherTiger will keep you covered for the 2017 hurricane season with forecast innovations rolling out this spring, many of which do not even involve pepper emojis. Rather, we will be implementing very significant predictive technology upgrades involving more frequent seasonal forecast updates, more and better input data, upgraded visualizations, and an expanded catalog of impact parameters including cases of damaging wind without landfall (which will better capture the threat from close calls like Matthew). Get excited! Until then, have a great holiday season, and congratulations on surviving 2016, active hurricane season and otherwise.